Folding Frame Net and bag. Can only be used with a handle, ordered separately. 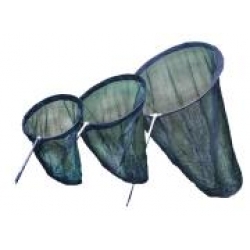 A range of superbly made nets, with quick folding steel frames and well fitted bags. They are sold as frame and bag WITHOUT handle. It is essential to order one of the handles, without which the net frame will not function. Select the handle from the from the handle range shown in this section.